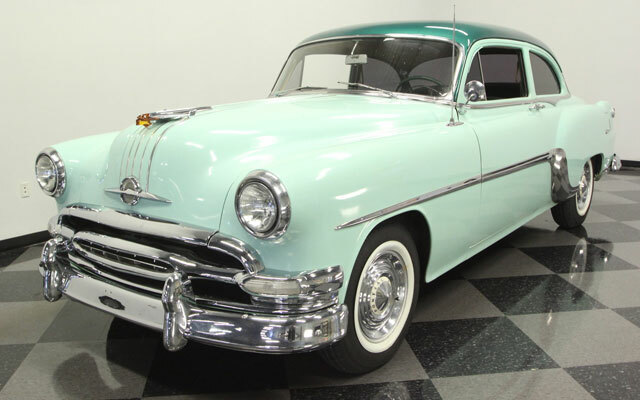 Cars such as this 1954 Pontiac Chieftain are coming of age in today’s collector car market. It used to be that people just thought they looked “old.” But today this gleaming chrome legacy from the early 1950’s takes on a new glow. This 1954 Pontiac Chieftain is being offered for sale by Streetside Classics. (See dozens of detailed photos and a lengthy history at this link.) 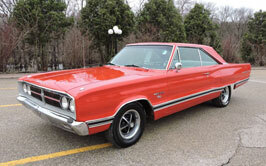 This week, Cars-On-Line.com has named it one of its popular DEAL of the DAY candidates. Whenever we feature an early ’50s Pontiac Chieftain on Facebook we get a lotta’ likes. In this case, Streetside says this is a “stuning” example. The Pontiac’s 268 ci Straight Eight motor earned a reputation for being smooth, reliable and quite sturdy. They say it is authentic right down to the oil bath air cleaner. They also note how straight and clean the body is. The classic detail includes the color-matched fender skirts and correct polished hubcaps over whitewall tires. It will be the DEAL of the DAY on Sunday when the world will see it offered for $14,995 on the front page of the Cars-On-Line website. The DEAL of the DAY preview gives you first shot at all the cars that will be highlighted in the DEAL of the DAY feature on the Cars On Line home page. Often these cars sell in the newsletter before they even make it to the home page! You’ll always see them here first though. For a preview of all of the DEALs of the DAY for the coming week follow this link to the recently published Cars-On-Line.com newsletter.